As a meal planning HATER for many years, I must say it has taken a small personal breakthrough for me to accomplish what you are about to see. I am the kind of gal that RARELY uses a recipe, and LOATHES standing over a hot stove, especially on school nights when homework (or diapers, or our NEW PUPPY) are all awaiting my attention! Meal planning just is not in my vocabulary. We often throw something together at the last minute or settle for cereal on super busy nights. Well, I finally got sick of that. No longer am I standing in my kitchen, WELL past dinnertime, staring at the fridge wondering what I can concoct with the available ingredients. Truly, it should be a food network series (if food network still had good old cooking shows, that is!) I was sick of the guessing game. So, I made a list of the typical EASY meals I make for my family. Then I charted them onto a 28 day calendar (so that I would have four weeks worth of meals). I made sure to place the meals strategically. Like tacos on a night where there's football practice so I can guarantee a quick meal! Then I made sure to have meatloaf and mashed potatoes two nights before shepherds Pie, so that I could make the pie using the leftover mashed potatoes. A lot of thought went into the planning, and this is the hardest part. Next, for each meal, I listed the ingredients it took to make it. i omitted the obvious ingredients (like eggs, milk, or water to boil pasta, etc) because I know I always have those on hand. 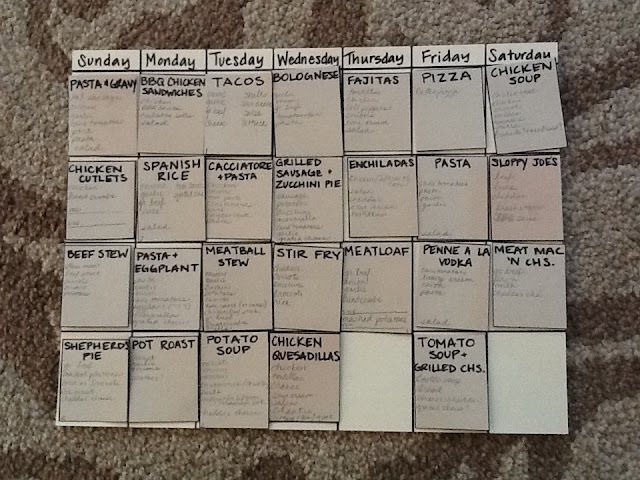 This makes it easy to make your grocery list for the two weeks - and this REALLY helps know your grocery budget. I just go through the ingredients for each meal and write out y list. Then when i come across a duplicate ingredient (like onions) I make sure and increase the amount listed so I purchase enough for each meal. Now, it may sound like a lot of work but it's the kind of job that if you do it right the first time, it pays off in the end and you won't have to do this dirty work again. The rest is easy as you simply live with the certainty that you have EVERY ingredient you need for a wholesome dinner on a whim! No more drive-thrus, cuz we all know how I feel about those! SO here is an image of my meal planning calendar: It's very basic considering the fancy ones out there. Websites sell meal planning software for an arm and a leg, but I'm a bit old fashioned. Paper, scissors and tape is all it took for me. This way I could move around the dinners as desired by simply unsticking my taped-on squares:) This is VERY PROFESSIONAL, people! As you can see, I am missing a couple of days worth of meals. And that's a lot of Mexican for an Italian mamma, right?! Well let's face it, Mexican food is cheap and quick! Just my style! This una mama is something else I read your blog all the time... I wish you would write more !